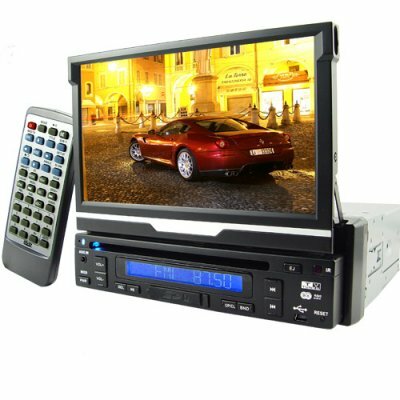 Successfully Added Car Video DVD Player - Single Din 7 Inch Touchscreen LCD to your Shopping Cart. 1 DIN sized vehicle DVD player with 7 inch touch screen LCD for playing all your digital media and featuring bluetooth connectivity with your mobile phone for safety while driving. With such features as a sharp 7 inch touch screen LCD TFT with motorized screen open/close function, excellent compatibility with many digital formats and disks, and a built in analog TV tuner, this compact sized car stereo DVD player packs a lot of entertainment into a small package. Make any vehicle shine with this highly advanced touch screen multimedia system! A great wholesale price makes this car stereo DVD player perfect either for the resale market, OEM market, or personal/company use. As always, it is only available from your source for wholesale direct from China electronic products, Chinavasion..